As the temperature drops in NYC over the next few months, it's a good time to venture to Broadway to sit in a warm theater and take in a play. 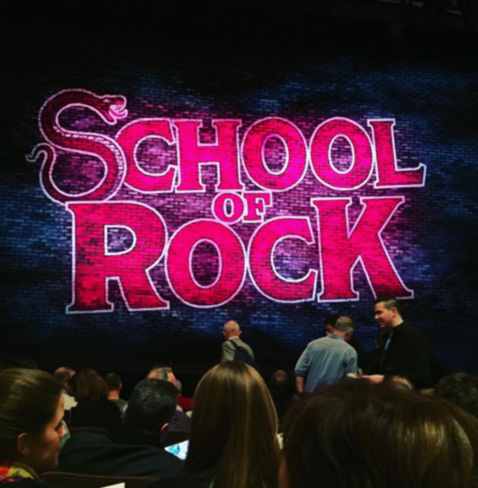 There are Broadway musicals out there that will rock your world. We have a list of eight to catch this winter, all of which I've seen with at least one member of my family, from sister to mom to child or a good friend. After all, every play requires a different kind of companion. I feel extremely lucky to have seen Hamilton off-Broadway before the real craze following its move to Broadway ensued. My sister and I saw it at the Public Theater when tickets for members were a mere $60. Now people are paying upwards of $177 per ticket. 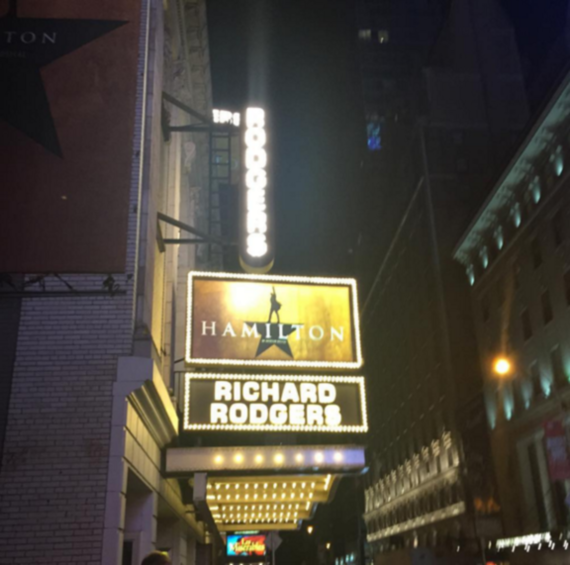 Following in the footsteps of plays like Rent, which took the same route from Off-Broadway to Broadway in the 1990's, Hamilton is a dose of innovative, edgy history and I loved it for this very reason. From the moment the cast starts bringing Founding Father history to life using hip-hop, rapping, and exquisitely composed songs and dialogue, you will be transfixed. This is the play of the decade, but tickets are scarce. Be sure to check out the #Ham4Ham daily lottery which offers 21 front-row tickets for $10 each. Fiddler on the Roof, a musical by Joseph Stein, was the first play I ever acted in. I played every song on the piano and watched the film over and over again. So, it was only natural that my mother accompany me to the new Broadway play. I played a Yeshiva boy and yenta, by the way, and I was happy to see females playing males in this version. The show is about tradition and a Jewish village grappling with change, revolving around a milkman and his wife and five daughters at the turn of the century. 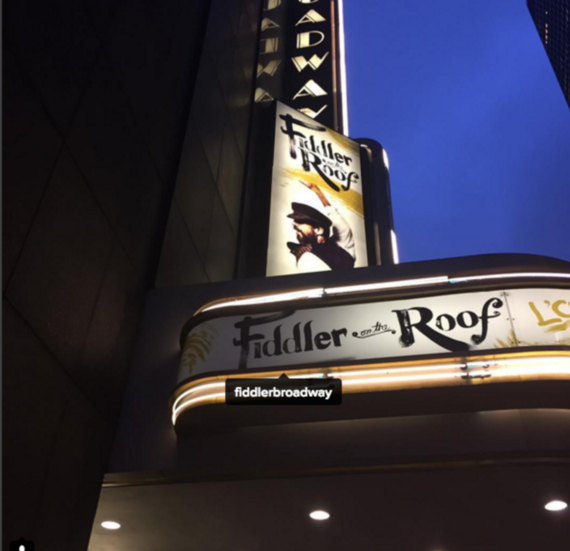 The combination of stage greats Danny Burstein and Jessica Hecht, a first rate cast and a faithful retelling of this famous story makes it more relevant than ever. There's a direct parallel going on between the story of the Jews of Anatevka and the story of the Syrian refugees today which makes the last scene particularly haunting. 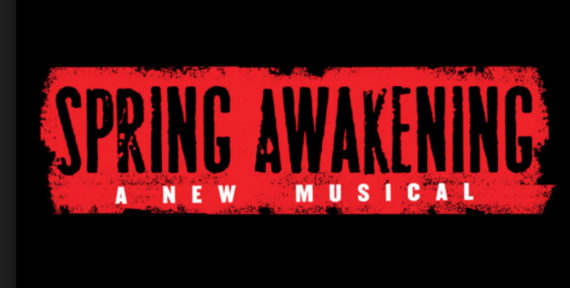 I took my best friend to see Spring Awakening, having heard amazing reviews from its run a few years ago with Lea Michele and Jonathan Groff (now a star of Hamilton). It's a rock musical with music by Duncan Sheik and a book and lyrics by Steven Sater. Based on the play Spring Awakening (1891) by Frank Wedekind, it's set in late-19th Century Germany and tells the story of teenagers discovering the inner and outer tumult of teenage sexuality. Alternative rock is employed as part of the folk-infused rock score and the show incorporates sign language into the performance, making it both innovative and haunting. Perfect show for a girls' night out, right? 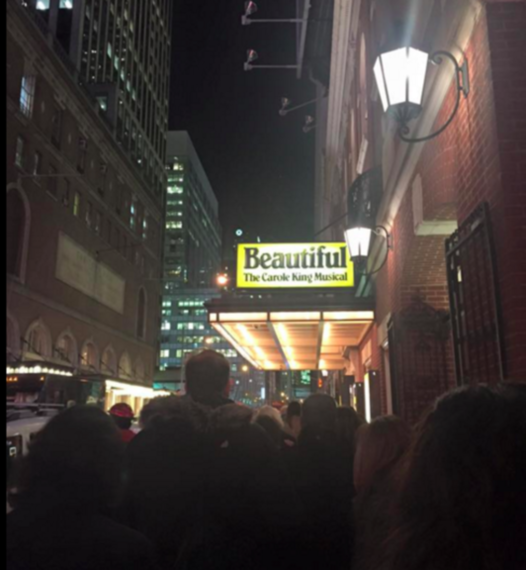 Beautiful is a play coined by the legendary songwriter and singer, Carole King, and her ex-husband and writing partner, Gerry Goffin, about their life together, and then apart. The pair met in college, fell in love and became a professional duo, writing songs for the likes of the Drifters and the Shirelles. My mom had to be my date for this show, given her history with the music from this era. King and Goffin's first famous song was "Will You Still Love Me Tomorrow?" at age 17, and when she heard it, I saw the sides of her mouth curl up in a brilliant smile. As the play travels through their extraordinary career, an uber talented cast sings each hit song. The show will make you sing - and it may well make you cry. It will easily make you dance in your seat, and you'll no doubt go home and download everything King ever wrote, particularly her first solo album, Tapestry. If you or your child loved the movie, School of Rock, starring Jack Black, there's no question you'll love the Broadway show, penned by famous composer Andrew Lloyd Weber and Downton Abbey writer Julian Fellowes. It follows Dewey Finn, a slightly edgy, scruffy musician who takes a class of elementary students and turns them into rock stars. School of Rock is inspiring and the cast of kids who play the future stars are wonderful. For my special needs son, who is a hard sell, to have enjoyed a show this much on Broadway, you know it's pretty spectacular. He's also been listening to the soundtrack ever since. 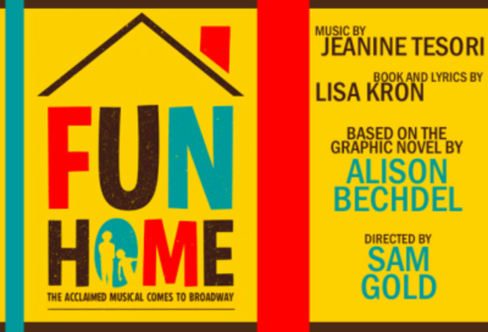 Fun Home is a Broadway play based on a book by Alison Bechdel (yes, of the famous Bechdel Test), and directed by the wonderful Sam Gold, is pure magic. Based on the best-selling graphic memoir, "Fun Home: A Family Tragicomic," by lesbian writer/cartoonist Alison Bechdel about her dysfunctional family and childhood in rural Pennsylvania, it's also about the power of memory and how our childhoods shape our entire lives. It made sense that my mom was my companion for this show - she happens to be from Pennsylvania and pretty much shaped my entire existence. The play certainly makes you stop to think and the songs are infectious to boot. Lisa Kron's adaptation, Jeanine Tesori's score, and the stupendous cast of actors makes Tony Award-winning Fun Home a memorable one. 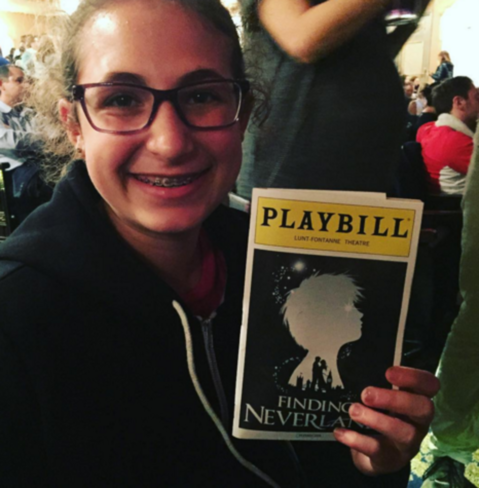 Finding Neverland is a refreshing reminder for adults to step away from the seriousness that surrounds us and join a band of pirates, chase a fairy, or just let our imaginations soar. It centers on the author behind the tale of the boy who never wanted to grow up, Peter Pan. J.M. Barrie finds himself a celebrated playwright in London with all the trappings, yet none of the joy. Matthew Morrison's (J.M Barrie) mere entrance on stage in the opening scene is enough to cause more than half the audience to applaud wildly, and it certainly got my Glee obsessed tween daughter excited. Fortunately, Morrison deserves the applause, he's just that good. Bring on the Fairy dust. Lincoln Center Theater has done it again with their Tony Award-winning revival of the Rogers and Hammerstein musical classic, The King and I. 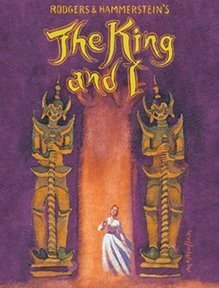 This production, with its spectacular set and lavish costumes, immediately transports the audience to 19th Century Siam. Under the direction of Bartlett Sher, the familiar story seems fresh and exciting. And then there's the cast. Broadway veteran Kelli O'Hara and movie star Ken Watanabe were perfectly cast as Anna and the King. It's a joy to watch them act and sing their hearts out on the stage. This is definitely a show that leaves the audience whistling a happy tune. I saw it with my sisters, and I have to say, this was definitely the right show to see with them. The music is swoon-worthy and we grew up with the film and were easily transported. So, clearly, you shouldn't fret if you can't score tickets to Hamilton - there are some really good musical options on Broadway right now. If your heart is set on seeing that show, check out the #Ham4Ham, the free bi-weekly pre-lottery show that takes place outdoors except during the wintertime (when you can find it online). But whatever you end up seeing, I'm sure you'll be happy - after all, there's nothing as good as a day - or night - spent at the theater at the perfect Broadway musical. This post, which previously appeared on the Findery Blog, was written by Holly Rosen Fink of The Culture Mom. Discover more of her travel notes on Findery.